It is the most classic example of selling ice to Eskimos! 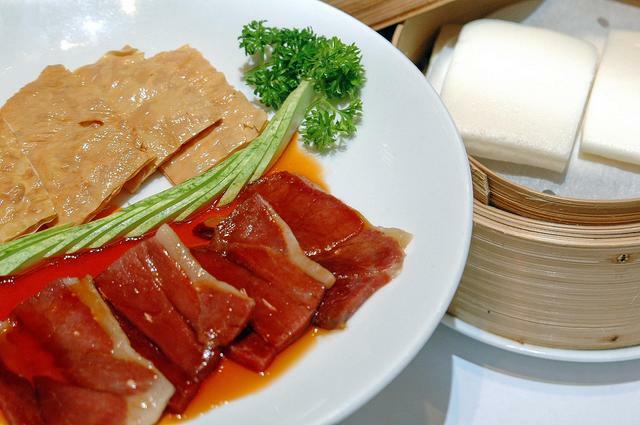 That is the impression I have of Singaporean-owned Crystal Jade group when I discovered they succeeded in enticing Shanghainese to partake their own delicacies in its modern, quick-service outlets found in several Chinese cities. Hoping to repeat similar success with its newly opened Crystal Jade La Mian Xiao Loong Pao outlet at the annex block of Lot 10, Crystal Jade's biggest lures are its ‘la mian’ (hand-pulled noodles) and ‘xiao loong pao’ (little dragon dumplings). With an open kitchen concept that accords diners their bustling dim sum and noodle-making theatrics, the new Crystal Jade outlet's meandering layout offers various seating options – an outdoor patio for smokers, simple and fuss-free table seating upfront for customers who want a quick bite, and a semi-enclosed dining section further back for bigger groups and private entertaining. The menu with colour photographs serves as a helpful guide on what are the dishes available here. An order form is provided so that diners can personally indicate which are the dishes they wish to order. Happily, we found the dainty ‘xiao loong pao’ (RM7 per order) passed muster as the dainty pork-filled dumplings were just superb with its sweet, soupy stock. Although not as good as the ones we had at Din Tai Fung in Singapore, they certainly can rival those we ate in Shanghai. Just remember to pick them up carefully with your chopsticks and try not to pierce the skin or else you’d lose the best part of these delicious morsels – the flavourful superior stock in it. 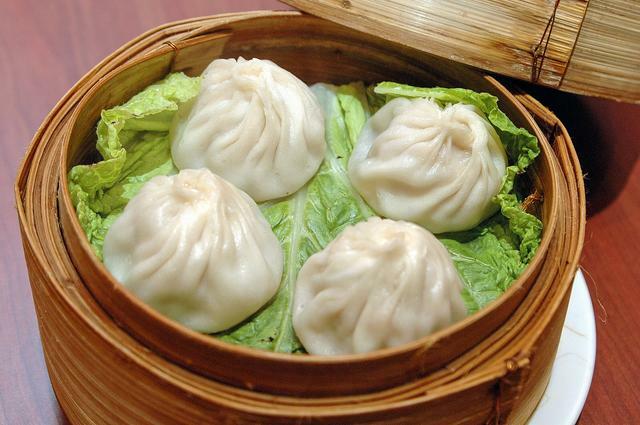 The only setback is the dumpling skin was a little thick but apparently the outlet chefs had to make it so after numerous customer complaints about the skin breaking apart too easily. It is always amazing to see a skillful ‘la mian’ chef hand-pull a chunk of floury dough into delicious threads of chewy noodles. His effortless demonstration belies the years of practice at getting this art of noodle-making just right. The fine noodles taste scrumptious too, complemented by deep-fried golden-brown meaty pork ribs (RM12). Less successful was the ‘la mian’ topped with minced meat and chopped mushroom in spicy sauce (RM10). While the sweet-spicy sauce was tantalizing enough, I wish it was less starchy with more minced meat in it. The ‘la mian’ with minced pork and vegetable wontons (RM12) was equally disappointing as the dish was rather bland and we had to perk things up with the ubiquitous chilli oil and vinegar. One of the more unusual and noteworthy dishes in the menu is sautéed egg white with fish meat (RM26). I recall a Shanghainese chef told me this legendary dish was created to satiate the Chinese emperor’s craving for crabs. What's an imperial cook to do but to put ingenuity to the test by whipping up a mixture of fluffy egg whites and white fish flakes. Needless to say this delicious mock crabmeat dish succeeded in appeasing the emperor. You’d wax lyrical over Crystal Jade’s version too - with a whole egg yolk mixed into the sautéed egg white and fish meat, the creation was velvety smooth. For a ‘do it yourself’ treat, the ham and crispy dried beancurd skin (RM24) is a memorable delight where you sandwich slices of briny and smoky Yunnan ham in red chilli oil and deep-fried ‘foo chook’ (beancurd skin) in between cotton-soft thin slices of ‘man tou’ bread. We also love the crispy eel (RM13). 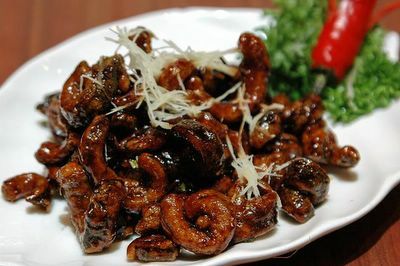 Cut into finger-thick slices and deep-fried until crispy, the eel was coated with a sweetish sauce and topped with some shredded ginger. A slightly more unusual Shanghainese specialty is deep-fried rice crackers with sautéed minced pork (RM16), a dish that pairs crunchy cakes of puffed rice with a robust, chunky sauce of pork mince, mushroom and beancurd dices. Nothing beats a refreshing ‘tong shui’ (sweet broth) such as sweetened dried longan with snow fungus and wolfberries (RM5) to wash down the hearty fare you had just eaten. Other types of sweet broth served include glutinous dumpling in sweet ginger soup (RM5.50), glutinous balls with sweet wine syrup (RM5.50), almond beancurd with longans (RM6) and mango pudding (RM6). Overall, Crystal Jade is a good and affordable place to discover the many culinary delights of cosmopolitan Shanghai. Service is quick and efficient, with the wait staff more than willing to guide you on what to order. 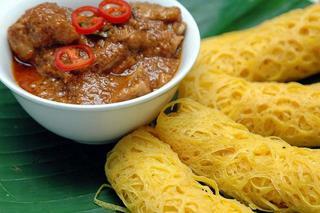 Comfort food at its best...roti jala! 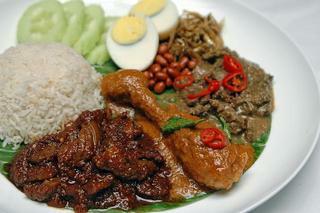 Tired of the local ‘kopi tiam’ for breakfast on weekends? Fancy tea and scones without paying a bomb? Head over Stan’s at One Bangsar. You can have your Nasi Lemak Kukus (RM25) with the whole works – ‘sambal sotong’, ‘minang’ chicken and ‘tok’ beef for brunch. The huge portion of fragrant steamed Bario rice is richly flavoured with coconut milk and herbs and accompaniments of dry-fried peanuts, ‘ikan bilis’ (anchovies), cucumber slices and a hard-boiled egg. The ‘sambal’ is a little sweet, just the way how a good nasi lemak ‘sambal’ should be while the brown squid makes nice chewy mouthfuls. I did not quite take to the tender beef shin in an aromatic and mildly spicy gravy though and prefer the ‘minang’ chicken with its tongue-searing spiciness. 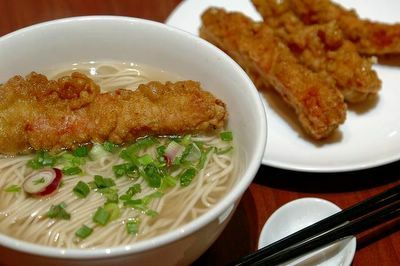 We can also vouch for the chicken broth noodles (RM19) – my kid quaffed the tasty chicken broth and ate most of the noodles laden with sliced shiitake and chicken without any fuss. Breakfast at Stan’s Deli is served from 9.30 am to 11.30 am daily. For a late lunch or afternoon tea, you can expect wraps, salads, rice, light bites and scrumptious sweets – a concise menu of Stan’s best offerings that are both hearty and satisfying. Stan’s Deli is really the ‘al fresco’ or outdoor section of the restaurant owned and managed by Stephanie Saw. Here the casual, idyllic ambience overlooks out onto a lush green garden setting and tinkling water features which is perfect to lounge over a leisurely breakfast or weekend brunch, enjoy afternoon tête-à-tête with bosom buddies and unwind after work over drinks with colleagues. The three salads we sampled bore testimony to her experimental touches – crabmeat with banana flower salad (RM18), tenderloin and mint salad (RM33), and prawn and mango (RM22). Despite its unusual dressing of balsamic vinegar and olive oil, the salad of crabmeat, chopped banana flower, ‘daikon’ (Japanese radish), carrots and Spanish onions seemed rather heavy and uninspiring on the tastebuds. The interplay of flavours and textures also lacked punch. The tenderloin salad fared slightly better with large, thin slices of seared tenderloin dressed in a piquant concoction of chopped galangal, mint, red chillies, shallots and lime juice and served on a bed of fresh romaine lettuce. Stan’s prawn and mango salad is yet another departure from the usual ‘kerabu’-style salad. This creation consists of large, fresh prawns and shredded young mango tossed in a tangy aioli (a sauce made from garlic, egg and lemon juice). Thankfully the aioli dressing is light and zesty enough to pull the whole ensemble together. For vegetarians, the assam pedas tofu mushroom noodles (RM16) will leave you replete. The robust dish of meehoon in mouth-watering sour and spicy gravy comes with soft Japanese tofu slices, shiitake and enoki mushrooms, pineapple slices and tomato wedges. Rice lovers will relish the bario rice sets (RM23-RM26). A complete one-dish, well-balanced meal in itself, you can tuck into steamed bario rice with your choice of fiery ‘minang ‘chicken, ‘tok’ beef /chicken, or beef stew accompanied by ‘lengkuas’ squid (simmered in light coconut gravy flavoured with shallots, chilli, ginger and galangal), cucumber and long beans ‘ulam’. If you like ‘roti jala’, then don’t miss sampling these lace pancakes with a choice of ‘minang’ chicken or lamb ‘maktom’ (RM10-RM12). It’s pure comfort food at its best! For something light, try the savoury prawn ‘botok’ (minced shrimp steamed in a spiced coconut mousse, RM12). What’s afternoon tea without scones, profiteroles and cakes? Try the chocolate durian cake (RM12), a sinfully rich pairing that you either love or loathe. Personally I am not too enamoured although these two happen to be my favourite indulgences. Still, Saw told us lots of her customers can’t get enough of this decadent confection. 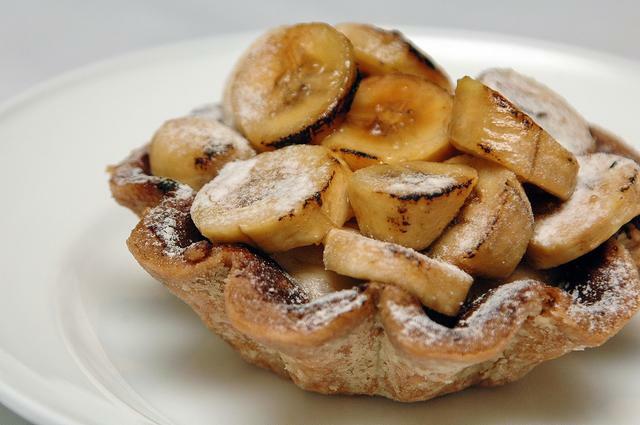 The banana cream pie (RM9) holds more appeal to me with the mini custard-filled shortcrust pastry shell brimming with slightly caramelized banana slices on top. 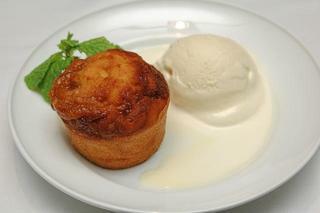 Equally scrumptious was the dense butter marmalade cake with a scoop of vanilla ice-cream (RM9). I can't wait to return and have the scones, cream and durian profiteroles, pineapple upside down cake, carrot walnut and chocolate fudge cake. Local sweets such as ‘seri muka pulut hitam’ (RM7) or ‘bingka labu’ (RM7) will go down well with ‘tong shui’ (sweet dessert broth) or sweet ‘bubur’– just ask the staff what is available for the day. Stan’s Assam&Garam which is the actual restaurant premises has a more upmarket and contemporary ambience that incorporates dark wood paneling and raw, unfinished concrete flooring. The walls are adorned with framed ethnic ‘pelikat’ fabrics and intricate pieces of wood carvings while plush Afghan carpets, trendy wood veneer lampshades and a soothing water feature in one corner complete the entire setting. Service can be a little erratic at times, with Saw having to keep an eagle eye on overall proceedings. The staff is generally friendly and helpful but occasionally, diners may have to be patient and bear with their inadequate grasp of English. The restaurant itself seats about 70 persons but combine with the deli area, the capacity goes up to about 120. Group bookings for private events are accepted with prior notice. You may have to splurge just a bit more when dining at Stan’s but be assured the quality of ingredients and food portions will more than make up for it. Nutty delight...you can't go anymore traditional than this! 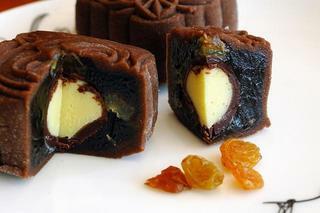 Chocolate in your mooncake anyone? 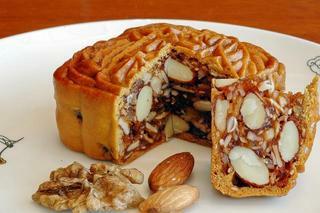 Mooncakes today have come a long way from its earliest version of baked pastries filled with plain sweet lotus paste. In recent years, the local mooncake market has been so lucrative that commercial bakeries and confectioneries outdo each other annually to grab a bigger slice of the market. So much so that sometimes the newer mooncake creations seem like a culinary experiment that has gone totally awry. A case of too many chefs spoiling the cake? Here's a peep of the good and unusual ones available. 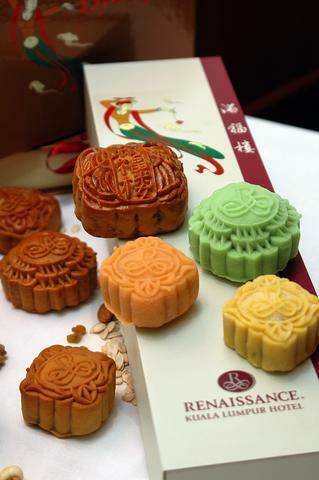 Renaissance KL boasts of mooncakes with new, unusual fillings alongside the more classical variants. 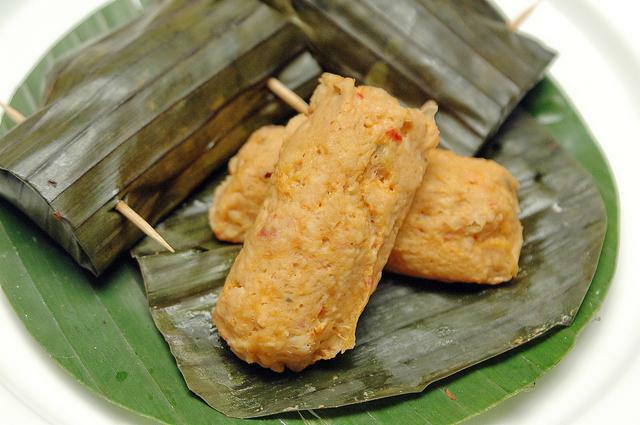 The innovative fillings incorporate fruity flavours such as durian, mango or orange paste, pandan lotus paste and chopped dried persimmon encased by snow skin or the chilled, unbaked skin. These are very light on the palate, with refreshing fruity-citrusy nuances coming through clearly. There is also snow skin mooncake with green tea and walnut paste which strikes a chord with us for its mildly bitter aftertaste. Special mention must be made of the assorted baked nuts with ham mooncakes – the nutty filling is imbued with the delicate fragrance and appetizing tanginess of ‘san kat’ (wild lime) and ‘kat peng’ (candied lime pieces) in addition to the sublime flavour of Yunnan ham. Dynasty's classic baked mooncakes are filled with either white lotus seed or pandan lotus seed paste that comes with single or double salted egg yolks. Prices range between RM7.00 and RM14.00 per piece. Specially designed elongated wooden gift boxes bearing the outlet’s Chinese fairy motif are available. Dim sum chef Leong Kok Meng rises to the occasion with two distinctive flavours that unmistakably exude the mooncake’s Chinese origins. Sweet osmanthus or ‘kwai fah’, a native Chinese flower that is favoured for its heady peachy-floral scent is used to imbue the lotus paste filling. However, the sweet osmanthus flavour is barely discernible. It would have come across better if the lotus seed paste has been used on its own instead of being added with the salted egg yolk. Still I discovered a nice peachy aftertaste lingering in my throat after eating two wedges of the said mooncake. Much loved by Chinese tea connoisseurs, the Pu Er tea is Chef Leong’s choice in the making of his smoked ‘Pu Er’ Mixed Nuts mooncake. These robust, earthy tea leaves and hickory wood chips lent their lovely aromas to the smoked assorted nut mixture for the mooncake filling. Other varieties available include plain red bean paste in either baked or snow skin, pandan lotus with single yolk and snow skin mooncakes with lotus paste and salted egg yolk. Spring Garden’s mooncakes are priced from RM11.00++ onwards per piece depending on the variety. Hong Kong chef Chan Kong Tung and dim sum chef, Chan Teck Woo put their heads together to conjure up fillings made from forest berries, white lotus seed with ginseng, golden custard with sweet corn and cheese with honey and walnut amongst others. Made from strawberries, raspberries, cranberries and cherries, the mooncakes' sweetness is tempered by the berries’ tangy nuances. Less extreme but equally interesting variants include mini snow skin with green tea, coffee or chocolate-whiskey fillings. Otherwise, you can’t really go wrong with traditional temptations like the Hong Kong white lotus seed paste with single yolk and pandan lotus seed paste with single yolk mooncakes. Prices for Tai Zi Heen’s mooncakes range between RM8.00++ and RM14.00++ per piece.